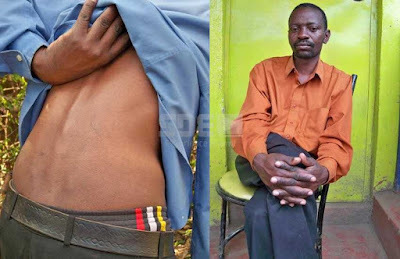 The true life story and confession of 47 year old former Kenyan cultist, named Samuel Mwema Muli, who allegedly killed more than 7,000 people from various parts of the country in less than ten years has surfaced online. According to Samuel, who he opened up to the Nairobian in 2014 when he revealed his ‘dark’ past and what led him to transformation, his outrageous satanic mission, he claimed, started one afternoon in 1992 when he killed his eight-month-old son, a evil act that made his first wife abandon him. “I met Francesca once more and she led me to another office where I saw three screens written ‘Kenya,’ ‘Uganda,’ and ‘South Africa”. According to him, on one of the TV screens hung inside the hall he saw the face of his 18-month-old first born son. “Then a Unclad woman came, gave me a sharp razor, commanded me to cut the face of my son on the screen and gave me Sh85,000(305,000),” Muli said. While adding tha three months after the incident, he was officially recruited as a member of the cult when the team leader took all his finger and toe prints. Afterwards, he started earning Sh9,000 every Friday, more money than the agency paid, therefore he had quit. According to Muli, with a steady flow of easy cash, he later invested in the transport business and acquired a fleet of buses that operated between Nairobi-Kisumu and Eldoret-Nakuru-Nairobi, but an enquiry by The Nairobian however revealed that the bus company he names is registered at the Kenya Revenue Authority under a different person. “The police were called, but since there was no damage on the ceiling, they left.” He added. While confirming the story, one of Muli’s cousins who lives in Salama, Musyoki, told The Nairobian that the preacher has not been in good terms with the family since he joined the cult, and has been somehow confused to date.